I finally gave it a name - Quad 2000. After all, it's made of four MA-500 modules ! The picture of the chassis below shows the transformer mounted against the rear panel. 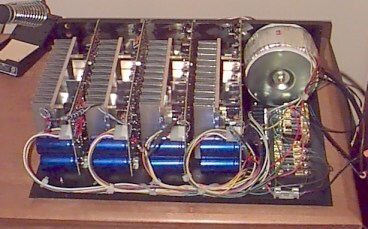 Immediately to the left is one of the amplifer modules. Towards the top of each module is the input phono plug connector. With the transformer mounted as shown, that first monoblock obtained a significant amount of interference from the transformer in the form of a low, but audible hum. This problem was solved by mouting the transformer against the side wall on the right (not shown in the picture below) 90 degress to its shown position. Doing so required that one of the fuse blocks also be moved to the side wall to make room for the transformer. 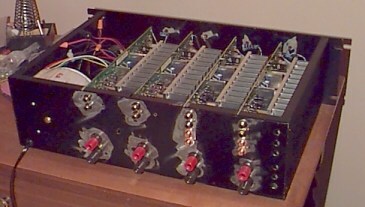 Here's a quick look at my completed four channel amplifier using Marantz amplifier modules. The modules were purchased in 1997 (February ?) and are presumably the same ones used in the highly acclaimed Marantz MA500 monoblock amplifier and the discontinued Carver AV-806x 6-channel home theater amplifier. Both are THX certified. The former is rated at 125 watts in 8 ohms with <0.05% THD while the latter is rated at 133 watts per channel into 8 ohms with <0.032 % THD+N. The Carver unit consists of 6 modules mounted side-by-side and is powered by two front-mounted transformers (three modules per transformer). For this project, I used a case I already had - an LG-1925 from Mark V Electronics. This case measures 5 inches tall by 17 inches wide by 11-1/2 inches deep - just tall enough for the modules. The transformer is a custom-made unit from Ulveco. It's secondaries are rated at 92VCT @ 5A and 32VCT @ 0.34A. At just under 5 inches in diameter, it too was able to fit standing up. This picture shows the position of the various parts inside the case. In front of the transformer are two fuse blocks (4 fuses each) from Parts Express and two 8-position barrier/terminal strips from Radio Shack. Two 8 amp fuses protect each module's +/- 46V rails. At the lower left, an additional 6 amp slow-blow fuse protects the main AC line. Wiring is modular, to enable easy debugging during construction. Each module has a 6 wire cable that's tied to the bottom plate of the case with nylon ties. Each of the 6 wires is connected either to the terminal strips or the fuse block via screws. Not shown in the picture above is an additional two wire cable from each module to light the front panel module power LED via a 1 k-ohm resistor. Each module is attached to both the bottom plate as well as the rear plate. Everything needs to be well alligned for this to work so I had a local metalworker do the drilling. This is the rear of the unit. Note that two of the four modules are "slave-only" and do not have the RC-5 RCA connectors (which I opted not to use anyway). 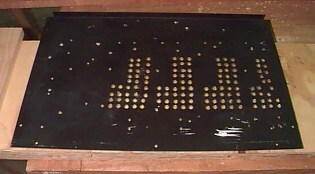 Some of the black finish has been removed during drilling. Holes were added to the bottom plate for air circulation. Like the rear, some of the existing holes are from previous projects that used to be in this case. The top plate also had holes added - a total of 364 ! - for circulation. They can be seen on this picture of the completed unit. 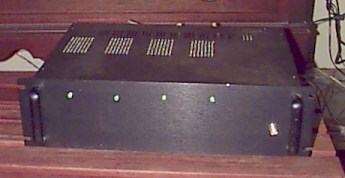 The front consists of four green LEDs, one per module, and an orange neon power switch. The green LEDs for the RC-5 capable "master" modules are driven by the "power" signal. On the slave units, the LED is driver by the board's regulated +15V line. That's all on this project. I've knowingly left out a lot of detail for the simple lack of writing time. The amp has been about a year in the works, with many months of indecision over what to do and how to do it. Now that it's done, I can finally sit back and enjoy them. The modules are outstanding and deserving of their reputation in their commercial incarnation. I have a lot of people to thank for making this possible, including Joe Reynick, Art Povelones, Bob Garnaas, Dan Turner, Russell Holm, Jeff Burger, Rex Gordon, Tom Williams, Michael Chizmar and Will Law. I apologize for leaving anyone out. Thanks guys !